Sony Xperia Z comes with some of the best specs on the market - and it's one of the most eagerly awaited handsets of recent months. A quad-core 1.5GHz Snaprdragon Krait processor, 13MP camera, 16GB storage (expandable, woohoo! ), 2GB RAM, water and dust-resistant, 1080p HD screen with Bravia Engine, LTE, to name a few. One thing the Sony Xperia Z certainly does have in common with every other smartphone out there is the fact that it is a pure magnet for fingerprints. Sony Xperia Z rocks in at 139 x 71 x 7.9mm/5.47 x 2.79 x 0.31 inches, so there's little room for anything else in your hands. The ports are spread out with the headphone jack up top, the SIM slot and volume rocker on the right - either side of a silver standby button - while both the microSD and charging ports are on the left, alongside contacts for accessories. A watertight port covers each. The front of the Sony Xperia Z is minimalist - showing off only a Sony logo and front-facing camera. The rear is a little busier, with various tech info printed on it, plus the Sony Xperia logo, an NFC badge, camera light and the all-important lens. That back is stuck fast - as is becoming the custom, you'll have no luck if you want to remove the battery. 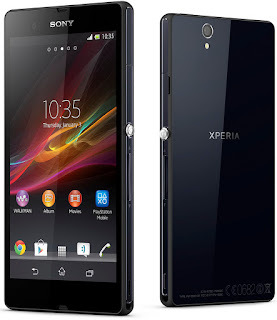 One of the selling points of the Sony Xperia Z is that it is also water resistant. There's something slightly unnerving about taking a £529 (around US$817/AU$789) phone and dropping it in the sink - but that's exactly what we did. And it worked absolutely fine. Clearly, you'll need to make sure the ports are covered using those watertight protectors, that much goes without saying. And at £529 (around US$817/AU$789) in the UK, this is not a cheap handset by any stretch of the imagination. It's actually the same price as the comparable SIM-free 16GB iPhone 5. Now, that's not to say that Apple product prices should set the benchmark, but considering we've often thrown out there that we think iOS devices are hideously overpriced, this is a very brave move from Sony.